People living in Toronto, Montreal, Vancouver, Calgary and Edmonton will see something amazing in their cities this weekend! Do not be alarmed if you spot a life-size replica of one of the “Oz The Great and Powerful” high-flying characters. 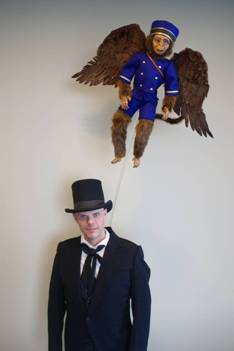 Street teams will be out and about and will consist of a lookalike of the Oscar Diggs character and a life-size model of Finley, a winged monkey that accompanies Oscar on his journey to the Land of Oz. The street team will be on hand to interact with movie fans, showing images and clips from the film and distributing prizes and collector items, all in promotion of the March 8th release of the film. Can not wait for this release!! Passersby who spot the Finley lookalike in their city this Saturday, March 2nd can also take a photo and tweet it using the hashtags #FlyingMonkey and #Oz for a chance to win an “Oz The Great and Powerful” prize pack. If you spot a character let me know! I would love to see all your photos! “Oz The Great and Powerful” is produced by Joe Roth, with screen story by Mitchell Kapner and screenplay by Mitchell Kapner and David Lindsay-Abaire. Grant Curtis, Palak Patel, Josh Donen and Philip Steuer are serving as executive producers. “Oz The Great and Powerful” opens in theatres on March 8, 2013. This would be so exciting to see! I’ll see if we want to brave the cold today for a chance to sight them in Toronto.